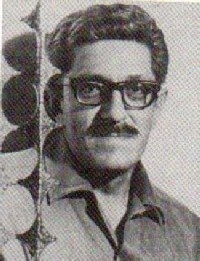 Efren Ordoñez was born on August 20, 1927 in Chihuahua. Son of Mr. Patrocinio Ordoñez and Ana Maria Villalobos. When he turned two, his whole family moved to Monterrey. He studied architecture at the Universidad Autonoma de Nuevo Leon where he wirked along side of Virgilio Rodríguez, Joaquín A. Mora y Héctor González. In the early 1950's, the city of Monterrey was almost completely barren of art galleries or institutions to promote artists. Regardless of this, Efren found his true passion when he started painting and drawing mostly for himself and friends. In 1952 he set up his first studio with Homero Cobas and William Dal Negri, where he produced various paintings, drawings and sculptures. As one of the precursors of art in Monterrey he set up an exhibit in October of that same year at the Edificio Rayón for the Third National Missionary Congress. His subjects were all religious and centered on the Missionary quests of Pope Pio XII. He finished his studies in 1953, but at the same time he was already an emerging figure in the art world. Mr. Ordoñez began to be commissioned for monumental works like the murals, paintings and stained glass windows petitioned by important figures like the Archbishop Don Alfonso Espino y Silva did for the Archdiocese of Monterrey. He exhibited again in 1955 at the Gallery of Arte AC, an independent school of arts in Monterrey and many more exhibitions followed in Monterrey, Mexico City and around the country. His works have been seen along side of those from Dr. Atl, Jorge Rangel and Gerardo Cantu. A retrospective of his oeuvre was held in 1976 at the Museo de Monterrey. In 1988 he was awarded the "Presea Estado de Nuevo Leon al Merito Civico" by the governor of the state of Nuevo Leon, Jorge A. Treviño for his involvement in promoting the arts and in 1989 a book was published about his life and work, written by one of his life-long friends and important figure in Monterrey Society, Aureliano Tapia Mendez. Efren Ordoñez, a pioneer of the art world in Mexico, died on August 21, 2011 victim to prostate cancer. He left behind a legacy of art that is continued by his daughter Sylvia and her husband Arturo Marty.